A new study published in the Metabolic Engineering Journal describes a method based on CRISPR/Cas9, which enables flexible engineering of essential and nonessential enzymes without additional engineering. This could be of great importance for various aspects including the development of bio-based production of pharmaceuticals, food additives, fuels and cosmetics. "When having a production strain this will make it easier for one to engineer certain limiting enzymes in the biosynthetic pathway and increase efficiency, specificity or diversity. People would be able to discover the best trade-off enzyme variants in the pathway and increase production of valuable compounds," says Tadas Jakociunas, Researcher at the Novo Nordisk Foundation Center for Biosustainability, DTU. The newly developed method is named CasPER and is building on existing technologies, such as CRISPR/Cas9, that has been used for genome engineering and re-programming in yeast during the last years. However, the new tool enables scientists to engineer enzymes or their active domains by integrating much longer diversified fragments providing the opportunity to target every single nucleotide in a specific region. In yeast, CasPER was able to integrate mutagenized DNA fragments with almost 100% efficiency even in multiplex manner. 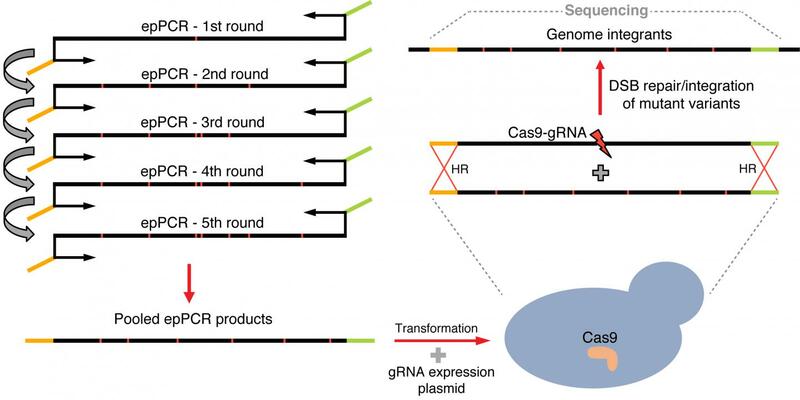 In depth characterisation of the new method concludes that the main difference between already existing CRISPR/Cas9 methods is that CasPER allows very efficient integration and in multiplex manner of large DNA fragments bearing various mutations to generate pools of cells with hundreds of thousands of enzymes variants. While other CRISPR methods rely mostly on integration of shorter sequences to diversify DNA and require multiple rounds of engineering, CasPER significantly broadens the length of engineered DNA fragments. Furthermore, it does not require any additional steps making it faster and more effective to diversify enzymes to produce higher yields of desired chemicals. Before the introduction of CRISPR/Cas9 it was a rather slow process to engineer essential enzymes in e.g. yeast. Today it is much more flexible regarding what you can target, and that makes it more viable to engineer enzymes to be more efficient and specific allowing them to transform more substrate into a product. "It is still very costly and time-consuming to build cell factories for production of valuable compounds so investing all that money and time on engineering it needs to pay off. You need to produce a certain amount of product to make it commercially relevant, and a tool like CasPER will definitely help to speed up and upscale this process," says Tadas Jakociunas. As a proof-of-concept in this study, the scientists targeted several essential enzymes in the mevalonate pathway. This biosynthetic route is responsible for production of sterols and is essential in most living organisms. By studies in humans it is best known as the target of statins, a class of cholesterol lowering drugs. These drugs are based on inhibiting some of the steps in the pathway. In some bacteria and eukaryotes this pathway is responsible for producing the largest class of compounds called isoprenoids. To prove the applicability and efficiency of CasPER scientists targeted two essential enzymes in the mevalonate pathway and were able to select cell factories with up to 11-fold increased production of carotenoids. In the future, CasPER can be widely used both in academia and industry for various purposes. Although the main application of the method was to speed up and lower the costs for engineering and optimizing cell factories, the method can also be applied for any experiment where diversification of DNA is needed. "You can study protein functions to develop protein structure prediction tools, and study protein interactions with DNA, substrates and other molecules to diversify regulatory elements such as promoters, terminators and enhancers," says Tadas Jakociunas. The method was validated in yeast, but it can also be applied in other organisms with efficient homologous recombination machinery.